The Australians strengthened their hold on the first Test match in Adelaide as the hosts made the visitors toil, giving away just one wicket on a rain-affected day on Wednesday. Resuming from the overnight score of 354-6, on-crease batsmen Steve Smith and Michel Clarke looked fluent in tackling the Indian bowling unit comprising of fast-bowlers Ishant Sharma, Mohammed Shami, Varun Aaron and leg-spinner Karn Sharma. The duo played stunning strokes all around the ground and completed their respective centuries eventually. Karn, who made his Test debut this match, finally succeeded in breaking the long 163-run stand between Michael Clarke and Steve Smith by getting rid of the former for 128. Smith remained unbeaten at 162 with Mitchell Johnson joining him in the middle just a few balls before stumps. 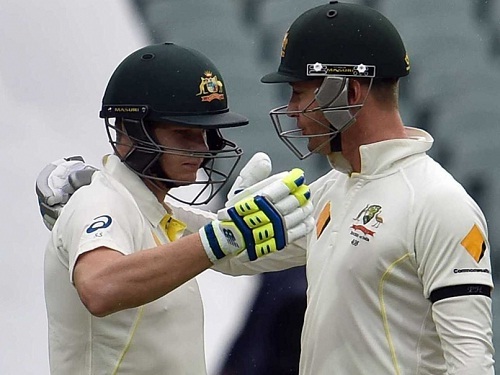 Australia were 517-7 at the end of second day’s play. To compensate for the lost overs on Day 2, the play will start 30 minutes early for the rest of the days.